In the ever-changing landscape of watches, big brands all try to capture an audience with their rich history, technical excellence, and a constant flow of new models. However, it’s the smaller independent brands who’ve been successfully capturing the audience’s hearts and minds over the last 10-15 years. Why? Independent brands are often built on a strong belief in creating something completely unique rather than just coming up with a new watch. Their success comes down to having a clear vision and the necessary skills to help make that vision come to life. One of the most famous names in the independent watch industry is Kari Voutilainen. This Finnish watchmaker has become one of the industry’s leading voices by blazing his own trail, creating one-of-a-kind watches, and giving back to the industry. Let’s take a look at the world of Kari Voutilainen. Kari Voutilainen’s watchmaking story begins on the edge of the Arctic Circle in the city of Rovaniemi in northern Finland—not somewhere most people would think of when talking about world-renowned watchmakers. Voutilainen traces his interest in watches back to a visit to a family friend’s watch-repair shop at age thirteen. He then went on to attend the Finnish School of Watchmaking in the early 80s. Despite the ongoing quartz crisis, Voutilainen always knew mechanical watchmaking was the direction he wanted to go in. After spending a few years doing some repair work in Finland, he decided to pack his bags and enter the larger world of watchmaking by enrolling in the famous WOSTEP (Watchmakers of Switzerland Training and Educational Program) school in Neuchâtel, Switzerland. After finishing his education with WOSTEP, he began working for the Swiss watch company Parmigiani, where he did repair work for another nine years. During this time, he also began work on his own tourbillon pocket watch. Voutilainen would spend three years working on it after getting home from his day job, finally finishing it in 1994. This was the watch that would make Voutilainen’s name as a watchmaker. In 1999, Voutilainen left Parmigiani to focus on teaching at WOSTEP and creating his own watches in his free time. This went on for three years until his overtime hours at WOSTEP restricted how much time he could dedicate to his own watches. It’s at that point he decided to start his own watch company in Môtiers, Switzerland in 2002. He initially made a lot of watches for other companies so he could save up enough money to finance his own tools for building his own watches. In 2004, Voutilainen decided to devote more time to his own brand following separate conversations with fellow independent watchmakers Philippe Dufour and Vianney Halter. Both encouraged him to focus his energy on his own brand and show the world his skills as a watchmaker. This resulted in Voutilainen exhibiting a watch under his own name at Baselworld 2005. This would turn out to be the watch that changed it all. Once Voutilainen put his name out there, people began recognizing his talent as an extraordinary watchmaker. He started making watches from existing movements, adjusting and enhancing them with different functions and finishing them to the highest standard. His Observatoire Limited Edition even won first prize for ‘Best Men’s Watch’ at the Grand Prix d’Horlogerie in Geneva in 2007. That was the first of four Grand Prix d’Horlogerie awards Voutilainen has won to date. As successful as Voutlainen was, he also wanted to stop relying on existing parts and movements from other manufacturers. The time had come to become more independent and create his own watches in full. 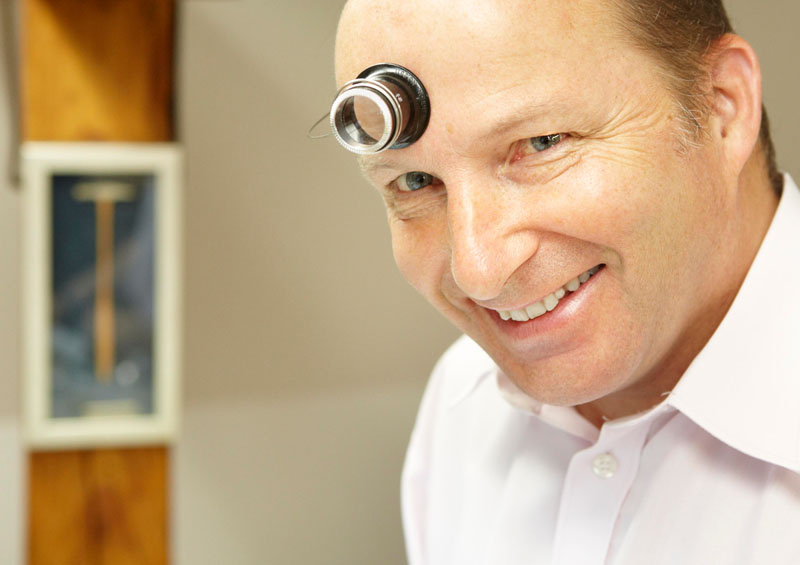 In 2007, he started making his own watch parts, with work on his first in-house movement beginning only a year later. It took him three years to complete his Caliber 28, which debuted in the Voutilainen Vingt-8. The most remarkable feature of this movement is its use of a double-wheel escapement instead of a standard Swiss-lever escapement. Almost every watch Voutilainen currently produces has an in-house movement with a double-wheel escapement, as this system is more efficient and Voutilainen is able to produce it in house. This wouldn’t be possible with a Swiss lever escapement because it’s too difficult for in-house production. Voutilainen creates watches featuring different technologies and functions, such as tourbillons, GMT functions, power reserve indicators, chronographs, and minute repeaters. Each is a testament to Voutilainen’s incredible craftsmanship. Voutilainen’s desire for independence didn’t stop at making his own movements. His incredible talent for high-quality finishes combined with the wish to create distinct designs led him to purchase his own dial factory, Dialtech SA, in nearby Saint-Sulpice, Switzerland. He renamed the company Comblémine after the street in Môtiers where his workshop is located. This gave him even more freedom to independently produce watches to his standards and individual taste. Voutilainen’s watches take classic looks and pair them with a very clean design. Since Voutilainen makes custom-made watches for clients, conversations with future owners also have an impact on the way any given watch will turn out. This combination of Voutilainen’s signature style with a client’s individual wishes often results in remarkable timepieces. That’s why you’ll find an otherwise classic-looking watch with an amazingly colorful dial on a purple leather strap. Voutilainen’s work is as recognizable as it is diverse. Voutilainen’s watches are a testament to his principles and methods. As of 2019, his team of 20 individuals produces 50 watches per year. They have control over every step of the process: from the design and production of the watches, dials, and movements to the detailed finishes and assembly. The company is completely independent, so it can set quality standards without relying on suppliers. Ultimately, this has been the secret to Voutilainen’s success. His goal of producing world-class watches has not only made him a successful watchmaker but also one of the best examples of how a vision and a set of principles can still build a successful independent company in the modern watch industry. What is an in-house movement? From Audemars Piguet to Zenith: Chrono24 team members share their watch collection! What trends, watches, and brands played an important role in 2018?